…USHERING IN A GLOBAL “BEAST” SYSTEM? The 17th and 18th chapters of Revelation contain a prophecy about the fall of “Babylon the Great” in the latter days. Babylon the Great is identified in Revelation 18:3 as an alliance of the “kings of the earth” with the “merchants of the earth.” The “kings of the earth” are governmental / political leaders in the global public sector and the “merchants of the earth” are business / financial leaders of the global private sector. It is easy to identify this alliance in the modern world. This biblical prophecy also foretells that this global world system will collapse at some point in the latter days. This article examines the possibility that we are seeing this prophesied collapse unfold before our very eyes. Indeed, this article will propose a surprising, possible fulfillment of this prophecy which Christians have overlooked. If this fulfillment scenario is correct, we are much near the end of this age than any of us have realized. Babylon the Great, as prophesied in the Bible, is the globalist financial / political system known as western capitalism. There is no other alternative. The “merchants of the earth” is a phrase which, though penned almost 2,000 years ago, aptly describes the global, multinational corporations now dominating world trade. Revelation 18 prophesied these latter-day “merchants” would have a global customer base (i.e. “merchants of the earth”). Revelation 17-18 predicted that multinational corporations, in league with the world’s political leaders, would come to dominate a global political / economic system in the latter days of our age. This prophecy has been literally fulfilled in our time. The Apostle John lived in a low-tech era when he wrote this prophecy. John also penned prophetic words in Revelation 9 about global world wars at the end of our age in which he described visions of jet fighters, helicopters and tanks with difficulty given the low-tech language of his time: flying “locusts” with “breastplates of iron” and incredibly loud noises coming from their wings as well as armored “horses” with “breastplates” which issue “fire” out of their mouths (verses7-10, 17-19). Let’s be consistent and realize that John was also describing the latter-day global economy and high-tech world of modern finance in Revelation 17-18 in the low-tech language of his day. The world has been traumatized in recent weeks by wildly-gyrating markets in equities, currencies and commodities, a global credit crisis, collapses in the housing and auto markets, unprecedented “Depression-era” bailout plans, etc. Most accounts attribute the origins of this global crisis in financial markets to the collapse of the sub-prime lending market in the USA and the resultant devaluations of all structured “investments” based on the US mortgage market. Since Freddie Mac and Fannie Mae debt and mortgage-backed securities were owned by many nations, the problem quickly became a global one. Indeed, it is getting worse. The first link below relates that Taiwan wants to dump its holdings of Freddie and Fannie debt. If even allies don’t want to hold federally-guaranteed US debt, it is a very ominous sign indeed. Entire nations are pleading with the IMF for financial rescues. The US Fed and Treasury are trying to bail out/rescue the US banking system, huge insurance companies (like AIG), provide short-term credit to commercial borrowers and even California for a time considered asking for billions from Uncle Sam to bail it out of its budgetary misery. One wonders how long global equity markets must plunge before there is a coordinated, global stock market shut-down. Media reports focused overwhelmingly on two leaders trying to manage / manipulate world markets in a way to keep the entire debt-based system of global finance from going irreversibly over a cliff. Those persons were Federal Reserve Board Chairman, Ben Bernanke, and US Treasury Secretary, Henry Paulson. Jointly, they quick-talked the US Congress into granting Sec. Paulson a $750,000,000,000 bailout fund, and warned that if Congress didn’t approve the bailout bill, it would result in a global credit crisis and collapsing stock markets around the world. Congress did what Bernanke and Paulson demanded and what happened? A global credit crisis and collapsing world stock markets occurred anyway! As some observers have noted, this hasty action “bailed out” not the American nation or its taxpayers, but rather the Wall Street tycoons whose reckless financial innovations caused the problem! To put this in Revelation 18’s context, Babylon the Great’s “merchants” convinced a complicit White House and Congress (Babylon the Great’s “kings”) to rescue the “merchants of the earth” from the consequences of their own actions while sticking innocent taxpayers with the bill. Bernanke and Paulson are the dominant American faces of “Babylon the Great,” the financial system foretold in Revelation 17-18. Sec. Paulson (dubbed “King Henry” on a recent Newsweek magazine cover due to the king-like powers granted to him by the US Congress) epitomizes the “kings of the earth” (the political side of the world economic system) and Fed Chairman Bernanke epitomizes the “merchants of the earth” (the Federal Reserve Board is actually a private bank whose shares are owned by a select group of global banks). Revelation 18:3 accurately foretold “all nations” would belong to this end-time, global economic system, and that the political leaders would be so “in bed” with the economic/financial leaders that it uses the term “fornication” to describe their relationship. Indeed, it is hard to identify where the public sector leaves off and the private sector begins! Sec. Paulson, now representing the political side of the alliance, was formerly the CEO of Goldman Sachs, one of the primary beneficiaries of Paulson’s and Bernanke’s actions in world markets. The Treasury official designated to manage the $750 billion bailout fund was also a former executive of Goldman Sachs. The private and public sectors are all but merged, just as Revelation 18 prophesied. It has been reliably reported that Bernanke’s and Paulson’s interventions staved off a global collapse of world financial markets in September, 2008 (remember this date for later!). However, their actions / interventions have been unprecedented and increasingly desperate. Will these efforts succeed in saving the modern global economic system known in the Bible as “Babylon the Great” or have they merely delayed a pending collapse? Revelation 17-18 prophesy that “Babylon the Great’s” system will collapse during the latter days, but the Bible doesn’t give a date for that event. However, given the severe paroxysms now occurring in the global financial markets, are we now witnessing the prophesied collapse of Babylon the Great? Certainly, the current global system could rescue itself and continue on for a longer period of time, but it is also possible that we may see the fulfillment of one of the climatic prophecies of the book of Revelation. The global financial/economic system is named after Babylon the Great in the Bible because its financial institutions began in ancient Babylon. The beating heart of the modern financial system is the banking industry, which creates money “out of thin air” and then loans it into existence, charging interest to those who borrow the very money which previously didn’t exist. Via the modern fractional reserve banking system, banks serve as “money multipliers.” Those wishing more documentation about how ancient Babylon invented the banking system can read my article What Kind of Captivity?, available at this website. The ancient Babylonian banking/financial system was prophesied to become so “Great” at the end of this age that it would dominate “all nations” (Rev. 18:3). This has also literally come to pass in our modern world. I used to think that Babylon the Great’s system would collapse when Jesus Christ returned; however, I now see that a literal application of Bible prophecy allows for an earlier fulfillment. Revelation 17:3, 9-18 indicate that a latter-day “beast” power with “seven heads and ten horns” will emerge and turn wrathfully against Babylon the Great’s system–“burning it with fire” (Rev. 17:16). This has to happen prior to the return of Jesus Christ because after the beast power overthrows Babylon the Great, it later makes war against the Lamb (Jesus Christ) at his return and is, itself, “overcome” by the Lamb’s army (described in greater detail in Revelation 19:11-21). After Revelation 17 prophesies that Babylon the Great’s global system will unravel in the latter days, it also foretells that it will be replaced by a new global, “beast” system. The next chapter, Revelation 18, describes in detail how Babylon the Great’s system will collapse. Let’s examine Revelation 18’s prophecy about the collapse of Babylon the Great’s by plugging modern events and high-tech, financial realities into this prophecy. Before beginning, I will acknowledge that I first heard elements of the scenario I will now describe from someone who broached initial speculation about it 6-7 years ago. I think he was a Messianic rabbi, and I wish I could offer due credit to him, but I can no longer recall his name as we lost contact years ago. Given that the modern financial system is, as of this writing, teetering on the precipice of collapse, this scenario can be fleshed out and is worthy of consideration. Revelation 18:2 proclaims “Babylon the Great is fallen, is fallen.” It is intriguing that the phrase “is fallen” is stated twice. The fall of Babylon’s global system in the latter days will begin with two great “falls” or “collapses.” Babylon the Great’s system dominates world trade (Rev. 18:11-19), and on September 11, 2001, the “Twin Towers” of the World Trade Center were hit by airplanes in an epic terrorist attack. These two behemoth towers, the symbols of global world capitalism, collapsed “live” on TV, shocking all the world. Revelation 18:10, 17 & 19 add that this “desolation” will occur “in one hour.” The Twin Towers did, indeed collapse within ”one hour” of each other. The number “seven” is often significant in biblical contexts. The current global crisis in stock, commodity and credit markets was unleashed upon the world in September, 2008, seven years after the collapse of the Twin Towers on 9/11/01. Many media articles have noted the lavish, self-indulgent lifestyles of the CEOs and top executives of global multinational corporations and the politicians who wallow in the “campaign contributions” given to them by the agents of the global corporations. Revelation 18:3 & 9 prophesy that the “merchants” of the earth will be “waxed rich though the abundance of [the system’s] delicacies” and that the “kings” of the earth “lived deliciously” off this system. Many articles have documented a serious “wealth disparity” as greedy Wall Street CEOs sucked mega-millions for themselves out of the very companies they destroyed with reckless financial practices. They even shamelessly gave themselves “golden parachutes” worth more millions from failed companies even as stockholders and investors lost almost everything. Recent media stories focused on the grilling given by Congress to the CEO of Lehman Brothers whose executives gave themselves millions in “bonuses” as their company went bankrupt. AIG, an insurance company receiving approximately $85 billion in a bail-out, lavished a half-million on insiders at a posh resort even as they pleaded poverty to the government. Many nations have been “stuck” with unmarketable and devalued securities which they bought from Wall Street’s “merchants.” In foreign nations and even on “Main Street” in the USA, palpable fury is growing toward the self-indulgent leadership of Babylon the Great’s corporate and political system. Revelation 18:8 says these two great “falls” will be linked to “one day,” and something vital will be “utterly burnt with fire.” Can we link one single “day” to the two collapses foretold in Revelation 18:2? Yes! The phrase “9/11” has been embedded in the minds of everyone on earth as the “one day” when the Twin Towers, symbols of Babylon the Great’s global financial/commercial system, experienced two great “falls” as they collapsed within “one hour” while being “utterly burnt with fire.” Was this all coincidental or were the events of 9/11 the literal fulfillment of Revelation 18’s prophecy? Revelation 18:17-19 prophesy that these catastrophic two “falls” must occur in a seaport city, and New York City is a seaport city as well as a global commercial center. Revelation 18:17-18 refers to the anguish as the “smoke of her burning” could be seen by shipmasters in merchant ships in the harbor of the “burning” city. If you recall photos of the massive clouds of dust which enveloped all surrounding buildings in the immediate aftermath of the two collapses of the Twin Towers, it actually appeared that the entire city was enveloped in smoke when viewed from vessels off Manhattan. This viewpoint from sea-level is the very one described by John in Revelation 18. Revelation 18:12-14 prophesy that Babylon the Great’s global trading system involves the merchandising of all manner of goods and services. It mentions finished goods, commodities, precious metals and “chariots and slaves and the souls of men.” Consider these low-tech words in a high-tech application. “Chariots” would mean cars, trucks, SUVs, etc. “Slaves and souls of men” can mean the prostitution trade, but it has a much more salient application in our high-tech era. Consider the term “slaves” as applied to the millions of modern “debt-slaves” in Babylon the Great’s debt system. In recent years, those who took out mortgages, car loans, student loans, and credit card loans had these debts repackaged into collateralized (or “securitized”) investment vehicles by greedy Wall Street brokers eager to gain fat commissions by selling these now obviously-risky instruments. Officials in lax regulatory agencies and ratings agencies facilitated this process. Everyone who owed these debts had their “souls” traded and re-traded to faceless investors in many nations. Millions of people’s future income-streams were “bought and sold” (as debt-slaves) on high-tech Wall Street markets and John likened this to the slave trade that he could describe in the vocabulary of his time. An incredible array of investments, goods, services and commodities were literally “bought and sold” (i.e. “traded”) on Wall Street, the COMEX or in the World Trade Center of New York City, the seaport city where the two great falls occurred within one hour on one singular day in history. What more is needed to fulfill this prophecy? Interestingly, Revelation 18:23 foretold that Babylon the Great’s insiders would “deceive” all nations via “sorceries.” The Greek word translated “sorceries” is “pharmakeia,” from which we derive the word “pharmaceuticals” or “pharmacy.” The Greek word literally means “enchantment with drugs” (Young’s Analytical Concordance to the Bible, see “sorcerer,” p. 916, subhead 8). This prophecy can mean actual drug addiction among the Wall Street Whiz Kids who invented these “deceitful” investment options, but there is another high-tech possibility. It is well-known that Big Pharma is one of the largest industry groups on Wall Street and one of the largest givers of campaign contributions to the “kings of the earth” (the elected officials of the USA) who then “return the favor” by passing laws benefiting Big Pharma (the Medicare Part D program, denying Medicare the right to buy drugs in bulk at discount prices, denying the right of the public to discharge outstanding medical bills in bankruptcy procedures, etc.). Big Pharma is, according to some articles I’ve read, one of the largest (if not the largest) purchaser of advertising time on American TV. Big Pharma is one of the largest industry groups in the modern capitalistic system of Babylon the Great, but Big Oil, Big Auto, Big Defense Contractors, Big Etc. all benefit copiously from a complicit Congress which dispenses official favors to the industry groups which give huge campaign contributions to members of Congress. All of this affirms the accuracy of Revelation 18’s prophecy that the political and corporate leaders at the end of our age will be “in bed” with each other to mutually enrich themselves. 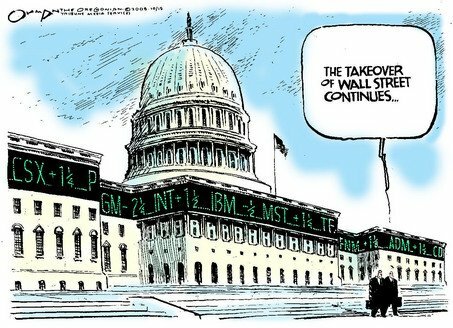 The extent to which Wall Street and the US Government have “merged” via the recent mega-bailouts is depicted well in the following political cartoon by Jack Ohman of the Oregonian, which I saw reprinted in the October 18, 2008 issue of the Minneapolis Star-Tribune. Revelation 18 prophesies that a specific “city” will be the hub of Babylon the Great’s system in the latter days. It will be a global corporate/financial/commercial hub, a seaport city and the site of two great “falls” or “collapses” in the latter days. Revelation 17:18 also reveals this “great city” will “reign over the kings of the earth.” This city can only be New York City. It is the home for Wall Street’s large banks and investment banks, the New York Stock Exchange, the New York Federal Reserve District, the COMEX, the United Nations and its many global agencies, various media and corporate headquarters, etc. While such cities as London and Zurich are also financial hubs, no Swiss city is a seaport and only New York has experienced the two great, prophesied “falls” amidst fire and smoke in the latter days. Only New York City hosts the United Nations headquarters, which figuratively “rules over all nations” as the forum where “all nations” assemble. With the unprecedented failures, mergers and bailouts of iconic American (and European) banks and financial institutions that have recently occurred, it is possible that the modern financial system will collapse and be replaced by a new world economic system. We do not yet know this for sure. We will have to wait and see it if occurs in the near future or in a later year. The current global system will collapse in the latter days when God’s timetable calls for this event to occur. However, the growing fractures in the global economic system and the desperate, unprecedented measures being taken to salvage it argue that we should consider that the fall of our modern economic system may be imminent. If this occurs, what will replace it? Revelation 17:1-9 states that Babylon the Great’s system will “ride” a group of nations metaphorically called a “beast” with “seven mountains and ten horns.” The western world’s economic decisions have historically been dominated by the “Group of Seven” nations. These could easily be the “seven mountains” (“mountains” being a symbol of large nations in biblical prophecies) of this prophecy. Verse 16 prophesies that at some point in the latter days, the “seven heads” will expand or morph into a larger group of “ten horns” which will “hate the whore…make her desolate…and burn her with fire.” The “beast” which has been dominated and ridden by the Great Whore of Babylon the Great will overthrow Babylon the Great’s system and destroy it. The revolt will be led by “ten horns,” and verse 12 prophesies that these ten world nations (or leaders) will give their allegiance to a new global “beast” system which will rule for only a short time on the world stage (“one hour”). The new “beast” system will itself be destroyed when it later opposes the heavenly armies of Jesus Christ who comes a few years after the beast power becomes ascendant (verse 12-14). Is a new global “beast” system about to replace the global system of Babylon the Great as a result of the convulsions now threatening to tear apart the world’s current financial system? The US Federal Reserve Board is creating so many dollars out of thin air that it could eventually end the US dollar’s role as the world’s reserve currency. The USA is now implementing “banana republic” financial measures, creating immense stresses in the global economy. President Bush was recently visited by French President Sarkozy and EU President Barosso at Camp David, after which President Bush announced a new global economic conference will be held after the US elections. I think President Bush was told to make the statement he made “or else” other world nations would make changes to the economic system without American input. Proverbs 22:7 states an immutable financial law: borrowers are “servants” to their lenders. The obscenely indebted USA is the “servant” to the global lenders. The world’s lenders could impose new terms on their reckless borrower, the USA. Some world leaders are openly calling for a new global economic system to replace the current one. The fourth link below (from Reuters) reports that Communist China’s official press states that “The United States has plundered global wealth by exploiting the dollar’s dominance, and the world urgently needs other currencies to take its place.” One Chinese leader said “all trade between Europe and Asia should be settled in euros, pounds, yen and yuan.” The article also mentions that an economic summit will soon convene in Beijing with only European and Asian nations invited (the exclusion of the USA speaks volumes). Some pundits think the imminent economic summit could result in a new “Bretton Woods” agreement which will rearrange current global economic realities. Many possibilities exist. A new global reserve currency might be created, based on a basket of currencies, on gold or an index of commodities. International alliances might be rearranged, at least temporarily, as nations seek to impose some stability on the currently destabilizing global financial system. Revelation 13:16-17 prophesies the new “beast” system which replaces Babylon the Great’s system will receive allegiance from all nations and will impose a new world economic order binding on global financial transactions. It is even possible that each nation will retain a domestic currency, but all international transactions will have to be conducted via a new monetary system binding on all nations. The form of this new “beast”’ system is not yet known, but Revelation 17 states that it will replace the current global system of Babylon the Great. Christians have long expected that the final “beast” system will be the most evil, oppressive, wicked system in world history. This may eventually occur, but the opposite may initially occur. The world’s populations, oppressed by the debts and financial chaos of Babylon the Great, might hail the arrival of a more equitable economic system implemented by the new beast system. Christians have seen so many TV documentaries about the Nazis and Hitler that we are programmed into thinking the “beast” system will be even worse than Hitler and the Nazis. Again, that may occur, but I think biblical prophecies indicate something else is more likely. It is an unfortunate happenstance that the word “beast” is so close to the word “bestial,” which has a wicked connotation. We automatically assume the worst because of this similarity. However, the beginnings of the “beast” system may be a great improvement over the previous system of Babylon the Great. The “Gog-Magog” nations of Russia, China, Iran, etc. may cooperate with European / western nations in the establishment of this new global system. Indeed, it may usher in a pseudo-millennium where all nations subscribe to a new economic / political system which promotes and/or promises “world peace and prosperity.” Revelation 19:19-20 prophesies the world’s nations will fight Jesus Christ and his heavenly armies to defend the beast system so vast numbers of people will think the beast’s rule is just fine. Revelation 17:9-16 prophesies that a beast system with “seven head and ten horns” will overthrow the global world system of “Babylon the Great.” Revelation 13:1-3 prophesies this same beast with “seven heads and ten horns” will emerge much to the world’s surprise, and that one of its seven “heads” will be healed of a “deadly wound.” If the “seven mountains” are the G-7 nations, one of these nations has to be the one which experiences the “deadly wound.” The USA is one of the G-7 nations. Current world events should compel us to consider that the “deadly wound” referred to by the Apostle John in Revelation 13:3 is the same great wound John saw inflicted on one of Babylon the Great’s hub cities in Revelation 18—the two great “falls” within “one hour” amidst “fire and smoke” on “one day” in a “seaport city” which is also a commercial / trading hub. If the G-7 nations are, indeed, the “seven mountains” of Revelation’s prophecy, we will have to await the final fall of Babylon the Great’s system to learn the identity of the “ten horns” responsible for her overthrow. These prophecies argue that the leader of the final “beast” system will not enter the world scene as some monstrous ogre who is even worse than Adolph Hitler. Far from it! Revelation 12:9 warns that Satan will succeed in deceiving the entire world in the latter days (except for those “very elect” spoken of in Matthew 24:24). II Corinthians 11:13-15 warns that Satan can dupe people into thinking he is an “angel of light” and his false human servants can appear in a most appealing guise. The traumas of the Nazi-era manifested Satan’s wicked, maniacal form, and it created a perfect foil for the final deceptive system which Satan intends to create on earth to oppose Jesus Christ at his return. Biblical prophecies indicate that the final world system, though energized by Satan himself (II Thessalonians 2:9-11), will have Satan manifesting himself and his human underlings as deliverers and messengers of light. So many Christians will “fall” for it that only the “very elect” will see through the deceptions. Biblical prophesies argue that the global leader of the final “beast” system is likely to be a popular, charismatic world figure who will rally support among all nations. Biden’s comments do argue that he already is privy to an agenda that will be implemented in the first six months of a new presidency that Americans will not like. Could it be the replacement of the dollar with a new “Amero” currency as part of a new global economic system, or a forced devaluation of the US dollar in a new “Bretton Woods” agreement? Perhaps the imposition of a North American Union on the USA, Canada and Mexico (like the EU in Europe) which will not be subject to the limitations of the US Constitution? On the other hand, Sen. John McCain may be elected as the new US President and specific events will unfold differently than expected by Sen. Biden. We’ll have to wait and see. This article makes no prediction re: the outcome of the US Presidential race, but I do assert this immutable truth: biblical prophecies will come to pass regardless of the outcome in the US presidential election. Watch world events in light of biblical prophecies! If the modern economic system of “Babylon the Great” falls and is replaced with a new global economic/political system, we are almost certainly entering the end game of the end-time prophecies. However, Christians should not be dismayed or lose heart. Christians have believed that the latter day prophecies would be fulfilled some day, so we should not be surprised when it actually happens! Indeed, it should increase our faith! Revelation 11:1-14 also prophesies that two great prophets of God, called the Two Witnesses, will conduct a three and one-half year ministry during which they will at some point be endowed with unprecedented Divine powers delegated to them by the Creator Himself. You can read a detailed examination of their ministry in the article entitled “The Two Witnesses,” available for free at this website. The Two Witnesses are martyred at the end of their ministry, but are resurrected three and half days after their martyrdom. Their deaths will trigger a great holiday on earth (Revelation 11:12), but the final “woe” of the age follows their resurrection (verse 14). I believe Ezekiel 38, Jeremiah 30 and Zechariah 14 describe that final “woe” which will befall the earth. That final “woe” will be a time of unprecedented danger which threatens the destruction of the human race itself. That is the point when Jesus Christ returns to save humanity from itself, overthrow the beast power and establish a 1,000 year reign of real peace and prosperity on the earth (Matthew 24:21-22, Revelation 19:11-21, 20:1-5, Micah 4:1-7).